A 99% More Efficient Mini-Angle Grinder from KATools. The Merlin2 has been completely re-engineered inside and out. 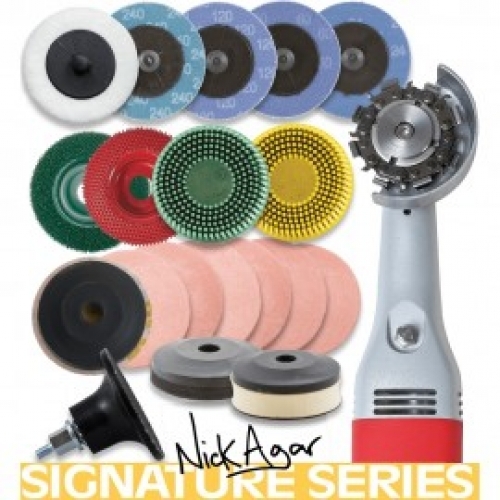 Nick Agar is a world famous sculptural woodworking artist who is a rock star in the woodturning world. He is in demand for demonstrations and classes internationally and is recognized by collectors around the world. His Norwegian Sunset Bowl is a beautifully crafted, multi-textured work that represents the best of woodworking and professional turning artistry. Nick and King Arthur’s Tools are jointly proud of the partnership and co-branding that has resulted in this fantastic Signature Series. Nick helped tremendously in the development of several key products which have a multitude of applications in the wonderful world of woodturning. King Arthur’s Tools® has added the versatility of traditional air powered accessories to the convenience of a variable speed electric power tool. An excellent choice for wood turning, wood carving, metalwork, miniature woodworking and finish work. 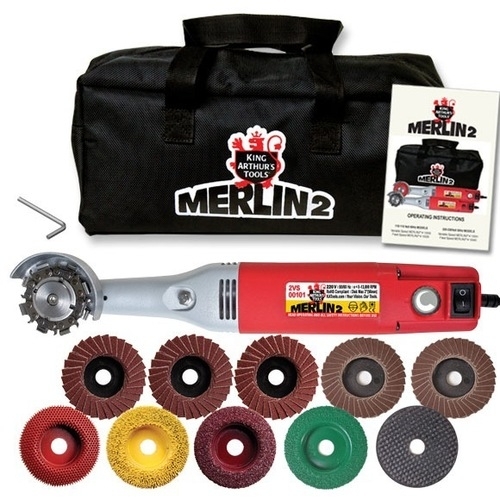 MERLIN2® eliminates the need for an air compressor with the ability to attach more than 50 accessories. Portable and versatile, MERLIN2® is a wizard of a tool for creating shapes, textures and getting into hard to reach areas. This set includes: 1 x MERLIN2® 220-230 Volt Variable Speed Angle Grinder * 1 x Flat Profile Disc With Tungsten Carbide Teeth On 3 Surfaces, front, edge and back ( Fine Grit) * 9 Sets Oversize Hook & Loop Sanding Discs, 80–1200 Grit • 1 x HTC Backing Pad Assembly with 9 x 2" (50mm) diameter Quick Change, 3M Roloc™ and Hook & Loop accessories.